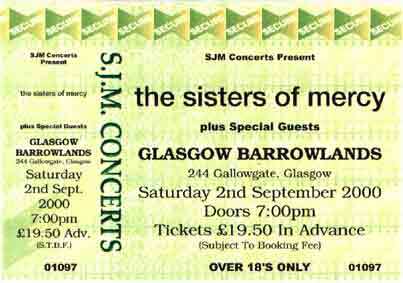 Over fifteen years have passed since the Sisters last played in Glasgow or Scotland in general. 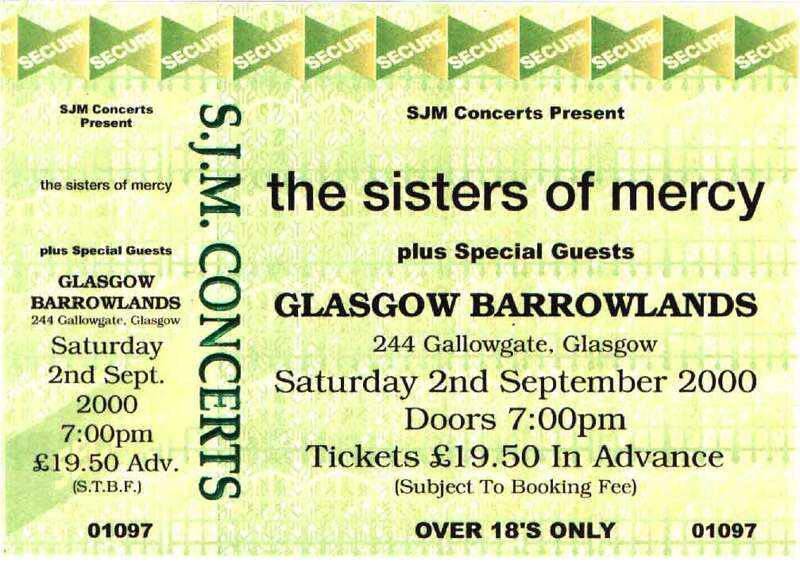 Back then it was Strathclyde University; tonight it is the Barrowlands. Perhaps it is in tribute to this gap that they choose to start their set with First And Last And Always. Whatever their reasons, it's a welcome surprise that gets the gig off to frenzied beginning. And if the venue isn't quite rammed to capacity, those who are there are determined to enjoy themselves. The set is similar to M'era Luna with the unreleased songs forming the core of the main set. A notable exception, in addition to the opener, is the welcome return of Alice. Crash And Burn (from the lyrics of which the tour takes its title), War On Drugs and Will I Dream, show the Sisters at their most Industrial, while more subtle guitar and bass are featured on Summer, Romeo Down and We Are The Same, Susanne. It is Adam Pearson's live bass that, for me, makes Romeo Down a stand out. As has been remarked elsewhere, Chris Sheehan's guitar work complements Adam's playing far more than the recently departed Mike Varjak, though how long this current pairing will last is anybody's guess. The last time I witnessed such synergy between Sisters' guitarists was Tim Bricheno and Andreas Bruhn at Birmingham NEC in 1992. Bricheno, it should be noted, immediately departed stage left to form X-CNN. The older material is reworked into sleek rock beasts, with Temple of Love, Dominion and Vision Thing sounding particularly powerful. The reclaimed Sisterhood song, Giving Ground, has also maintained its prominent place in the set. Eldritch, despite keeping between song banter to a minimum appears relaxed and happy. Perhaps it is the football terrace style chants of, "Eldritch, Eldritch!" that amuse him, or maybe he's genuinely happy to be playing to a Scottish audience again. Either way he promises to see us all again soon before leaving the stage. After a horrible ride in a not comfortable train I reached Glasgow. there I met up with Christer at the train station. It was really easy to find the Barrowland venue, after spending some hours outside the venue drinking beer (remember this kids, it's illegal to drink alcohol in public places in UK). we met a really funny Goth guy who was totally convinced that The Sisters is doing their shows play back, lol, meanwhile, we where augmenting with the guy, Andrew Eldritch came walking down the street before going in to the venue and no one beside me and Christer recognized him, really funny. This gig was brilliant, the best gig I have seen I years, yeah, I know that I usually say that after every show. but this night was brilliant. The show started with First And Last And Always and the audience was in for the rest. you could easily see that Andrew really enjoyed this gig and this audience. Alice was a real blast from the past in the rosy garden of Sisters classics. Flood 1 was really good to. If someone have taped this gig, please, feel free to contact me, I have some really rare tapes open for trades. But I doubt that someone have managed to get any recording equipment inside, due to very hard security. Some photos from the show can be found on Barrowlands' homepage. Alexa Williamson has written a review for LiveDaily.